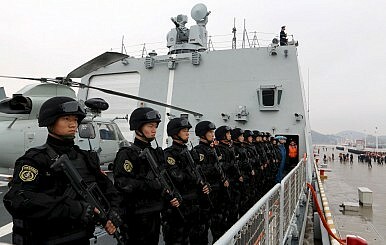 Soldiers of the Chinese People's Liberation Army stand on the deck before a fleet sets out for Aden, Yemen, from Zhoushan, Zhejiang province, April 3, 2015. As China reemerges as one of the globe’s leading powers, just what type of actor it will be on the world stage has become a subject of intense debate among China watchers and the broader public. With tensions rising to what one eminent China scholar has called a “tipping point” in U.S.-China relations, the Chinese government released its first-ever white paper on military strategy just before the fourteenth annual Shangri-La Dialogue was held in Singapore this past weekend. Since 2012, Beijing has indeed become more assertive in proximate waters, and the paper underscores determination to strengthen Chinese “strategic management of the sea.” Attention has rightly focused on expressions of Chinese resolve with respect to current points of contention such as China’s land reclamation on disputed features in the South China Sea. Most recently – following Pentagon predictions – China’s Coast Guard appears to be increasing activity near Luconia Shoals, roughly 60 miles north of Borneo in Malaysia’s exclusive economic zone. But the strategic thinking just published also reflects a much larger story of profound changes in Chinese foreign policy. The story itself is relatively simple: China’s participation in globalization has catalyzed an irreversible explosion of overseas interests. It has also afforded China greater resources and capabilities with which to advance and defend them. This combination has drawn China inexorably outward to become “more willing and able” – that is, active in international security affairs. In fact in many ways, China’s first-ever defense white paper on strategy is official policy catching up to reality. Because this trend is likely only to intensify, U.S. scholars and policymakers must understand it if they are to shape policies that can seize the benefits and manage the challenges stemming from China’s new normal of increasing international security activism. In particular, “China’s Military Strategy” publicly articulates innovations in China’s national security thinking in three key areas: a new understanding of the political framework for military force, enhanced security partnerships, and global power projection capabilities for the People’s Liberation Army (PLA). Because the drivers for this strategy are baked into globalization, several of these ideas predate the current administration, dating to Hu Jintao’s 2004 call for “new historic missions”; but they are ratified and given sharper emphasis here. For this reason, they are likely also to outlast Chinese President Xi Jinping’s tenure in office. Taken together, this strategy augurs a China that will be much more active globally on security issues. Politically, the white paper asserts a new global scope for China’s security interests and new flexibility in protecting them. We are told that, “the national security issues facing China encompass far more subjects, extend over a greater range, and cover a longer time span that at any time in the country’s history.” Beijing is cluing domestic and international audiences into the new, open-ended baseline for its involvement in security affairs, which reflects the reality of its global economic and political interests. Specific emphasis is placed on the security of access to overseas energy and resources, the people and infrastructure that support that access, and the sea lanes that those raw materials traverse. The strategy calls for China to participate in “jointly securing international [sea lines of communication].” This is eminently sensible for a country that, according to the U.S. Energy Information Administration, imports nearly 60 percent of its oil – a proportion that has doubled since the year 2000 and which is only expected to grow in coming decades. In order to safeguard these interests, China will take a “holistic view of national security.” One way to interpret this vague expression is that interests will now potentially override old ideologies such as doctrinaire opposition to “interference in the domestic affairs of other countries.” Notably, this is the first time a Chinese defense white paper has made no reference to the Five Principles of Peaceful Coexistence, the litany of historical PRC dogmas in which noninterference and other self-imposed restrictions are enshrined. In practice, over the past decade China has already engaged in multiple activities that exceed the bounds of traditional non-interference, including political mediation, unilateral and multilateral economic sanctions, and deployments of its security forces in other countries. It has involved itself in one way or another in Sudan, South Sudan, Libya, Syria, Iran, Myanmar, North Korea, and other places. In recent months alone, Chinese has dispatched naval vessels into Yemen’s territorial waters to evacuate Chinese nationals from escalating chaos and hosted peace talks between the Afghan government and the Taliban in China. Official policy is catching up to deep structural changes and the improvisations they have demanded. Indeed, the second major innovation in China’s new strategy is the deep recognition that China cannot operate globally without help from other countries. This strategy document, particularly compared with previous defense white papers, envisions robust strategic and operational military partnerships with the United States, Russia, and other nations spanning Europe, Africa, and the Asia-Pacific. There are also aspirations to “establish fair and effective collective security mechanisms,” continue increasing China’s voice in multilateral security dialogues, and participate more in cooperative security actions. Beyond reinforcing the message of China’s peaceful rise, deeper cooperation provides much-needed operational experience for the People’s Liberation Army (PLA) in the form of joint exercises or multilateral deployments, and may provide access to advanced technology, training, or even access arrangements to facilitate distant operations, such as the recently reported potential basing agreement with Djibouti. Again, in this case the emphasis on security ties reflects the reality that China – hungry for friends following its relative isolation prior to the 2000s – has in recent years deepened its defense relationships worldwide. Beijing now has “strategic partnerships” or similar umbrella ties with nearly 60 countries across the globe, and under these frameworks defense diplomacy with key states has risen dramatically. PLA Navy (PLAN) ships now routinely visit ports around Asia, the Indian Ocean region, the Middle East, and the coast of East Africa. The PLA has also instituted joint exercises with Russia, Pakistan, and Singapore, and routinely seeks additional opportunities. Commercial interests also support deepened ties: China is now the world’s third-leading exporter of arms, and is selling ever more sophisticated systems. In many cases, China will be seeking to strengthen ties with countries that already enjoy robust security cooperation with the United States, such as Saudi Arabia. Yet the pursuit of partners may also bring China into closer alignment with states like Iran and Russia, whose relationship with Washington is more fractious. Additional points of strategic interaction create the potential for both increased cooperation and competition. In its most forward-leaning innovation, “China’s Military Strategy” also signals that Beijing will put steel behind its willingness to do more and court new partners. China intends to build military forces that are capable of limited power projection across domains. The headline for this modernization program is a move from “near seas defense” to “the combination of ‘near seas defense’ and ‘far seas protection’,” which suggests the need to develop a limited blue water navy. Simultaneously, China has set other crucial goals in the air and other domains. Indeed, the PLA has already made headway across nearly all key determinants of expeditionary military power and has much room to grow if, as this strategy suggests, resources will continue to flow. A two-year study from the Center for a New American Security that the authors of this piece helped write analyzed the PLA’s inchoate power projection in five key areas: force projection, sustainment, capacity, command and control, and force protection. Each is a necessary but not sufficient condition for effective use of military power far away from one’s shores. China’s new strategy calls out each category as a specific goal across different domains. Force projection is a broad term in military jargon, but here it means expeditionary capabilities: naval and air platforms that can operate at and deliver effects over long ranges and other capabilities in rangeless domains like cyberspace. Many visible examples of this trend, especially China’s developing aircraft carrier program, have filled headlines in recent years. The strategy aims for the PLAN to “build a combined, multi-functional and efficient marine combat force structure” for use on the high seas. The PLA Air Force (PLAAF) aims to build capabilities for “air strike,” “airborne operations,” “strategic projection,” and other types of expeditionary airpower. The PLA missile forces, known as the Second Artillery Force, will also work toward “medium- and long-range precision strikes.” Even the lumbering PLA Army has set its sights on “multi-dimensional, trans-theater, multi-functional” operations. In many cases, platforms that can perform these missions are already in development or production. Sustainment is the provision of strategic lift, logistics, and personnel services required to maintain operations. The new strategy states that “China’s armed forces will deepen logistics reform in relevant policies, institutions and support forces, and optimize strategic logistics deployment,” including “comprehensive support” for the navy and air force, “sustainable [Army] operations,” and mobility across the board. The PLAN’s experience operating far afield in the Gulf of Aden has made the larger institution keenly aware of the need for a global logistics infrastructure. It is building the platforms – plus, as mentioned above, potential foreign facility access agreements – to realize one. Capacity denotes the sophistication and scale at which a military can operate. It is undergirded by both requisite amounts of human and material assets and the organizational processes to generate military power effectively. In the past decade, China has done a remarkable job of churning out increasingly sophisticated weapons: According to the Office of Naval Intelligence, “During 2014 alone, more than 60 naval ships and craft were laid down, launched, or commissioned, with a similar number expected through the end of 2015.” Sustaining and even increasing this pace across the services, and ensuring effective management of assets across their life cycles, requires better strategic management. Thus, the PLA will “optimize the functions and institutions of the [Central Military Commission] and the general headquarters/departments, improve the leadership and management system of the services and arms, and adhere to demand-based planning and plan-based resource allocation.” Many of these organizational reforms will be politically difficult, but the inclusion of these benchmarks in a public document displays some level of confidence by the top leadership. Finally, force protection refers to preventive measures taken to mitigate hostile actions against personnel, resources, facilities, and critical information. Operating far from one’s shores carries with it myriad vulnerabilities; this strategy recognizes those shortfalls and aims to remedy them. Naval and air modernization plans refer to “comprehensive defense” as a key priority, and indeed the PLAN already operates sophisticated Luyang-II and –III area air defense destroyers and is working to mitigate its traditional Achilles’ heel in open-ocean anti-submarine warfare, both key parts of force protection at sea. We and our colleagues assess that by 2030 the PLA will have achieved “limited expeditionary” status. While by no means approaching the capabilities of the U.S. Navy to engage in high-intensity operations globally, such a force could conduct a range of missions across the globe, to include: major humanitarian assistance/disaster relief, contested noncombatant evacuation operations, securing high-value assets such as North Korean nuclear weapons, defense of critical sea lanes, counterterrorism strikes, and limited stabilization operations. “China’s Military Strategy” is an ambitious vision for greater involvement in global security affairs commensurate with China’s renewed great power status and now-indelible interests on every continent. Absent a major conflict in Asia or discontinuous change in China itself, this is the new normal. Beijing is already working toward an expeditionary military and playing an active role in security issues beyond historically significant concerns such as Taiwan or the near seas. Fortunately, this more willing and able Beijing does not demand a wholesale rethink of the United States’ decades-old China policy, but merely an expanded, refined perspective. A global China will both present new opportunities for cooperation and accentuate areas of competition. The United States thus needs to widen the aperture of its three-pillar approach to China – engagement, shaping, and balancing – to account for the new scale and scope of China’s international security activism. With “China’s Military Strategy,” Beijing has published its part of the playbook; Washington must now formulate its response before the game is in full swing. Alexander Sullivan is an Associate Fellow in the Asia-Pacific Security Program at the Center for a New American Security and a prospective Ph.D. student in political science at Georgetown University. Dr. Andrew S. Erickson is an Associate Professor in the Strategic Research Department at the U.S. Naval War College. For more on this topic, see the CNAS report.